Once upon a time there were program notes—maybe a provocative line of poetry would serve. Then there were no program notes; all you needed to know about a dance was there for the looking. Recently, programs for dance events outside the mainstream have begun to publish short essays by choreographers and/or seasoned non-dancing thinkers. 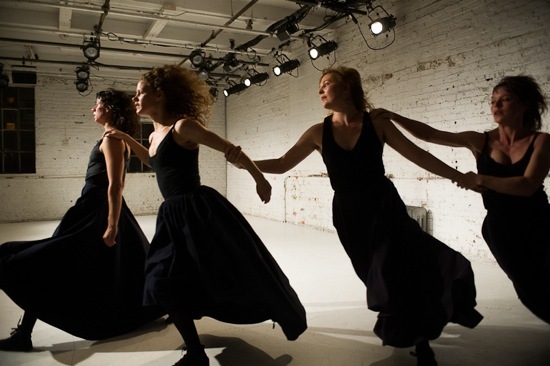 In terms of theorizing and probing into the ideas behind the work about to unfold onstage, these writings go way beyond, for example, the excellent program material written by Jacob’s Pillow’s resident scholars Suzanne Carbonneau, Maura Keefe, and Philip Szporer. The motive for the explanatory writing is understandable. For a long time, dance practitioners were labeled non-intellectual, and condescended to because of that. Over the past decades, a lot of erudite catching-up has enriched the discourse and opened eyes and minds. There’s only one problem with program essays—and it’s begun to come up in conversations before and after performances. Read the program note first and you watch the show stuffed with ideas about it. What happens if you then think you’re supposed to see all these in the choreography and don’t? Or perhaps you read the material afterward and try to pin it to your memories of what happened onstage. In either case, you may feel inadequately perceptive; perhaps you think the work has fallen short of its supposed aims (the emperor’s-new-clothes phenomenon). In those instances, the essay has had an opposite effect from its intended one: instead of opening up the work for the viewer (who can’t be presumed to be an expert), it erects a barricade between said viewer and the performance. This is a rather long —but I think relevant—introduction to a discussion of Katie Workum’s thrilling Fruitlands (at the Chocolate Factory April 18 through 21). Workum provided no program notes, nor does the dance need any. However, the title rang a bell, and the press release mentioned in the briefest and most general terms Workum’s interest in the 19th-century New England Transcendentalists and, more specifically, the short-lived (and short-sighted) Utopian community, Fruitlands, founded by Bronson Alcott and others. Their ideas about God dwelling in nature, freedom and discipline, health in mind and body, communal living, and rigor nurtured her creative process. The beginning of Fruitlands sets the tone of austerity and lushness, wildness and control, attended by the possibility of rapture. Pauly stands close to the audience, staring into the distance beyond it. She’s wearing a long, full, black skirt with an uneven hem and an intricately cut black bolero jacket over what turns out to be a tight-fitting sleeveless top (costumes by Bonkuk Koo). Jonathan Melville Pratt’s score seeps in with sounds that could be breathing or rain or both. Pauly’s far-seeing gaze changes almost imperceptibly; now she moves into reverie, now smiles faintly, now looks dejected. When low piano notes and soft thuds alter the atmosphere, she’s thrown into running back and forth along a diagonal. It’s as if strong gusts of wind—actual or mental—are blowing her along this path. When the others enter, one at a time, they seem at first as purposeless and storm-tossed as she. As they rush here and there, Koo’s terrific costumes turn them into a veritable storm of black clouds. Then the women calm the tempest. Entering and leaving in overlapping pairs, they run in curving paths yoked together, sometimes arm-in-arm. The music rumbles, yields a strong beat, gets louder. The run becomes a modest gallop, then a prance with one leg kicking out. The pairs join in a linked foursome. The wildness has become temporarily domesticated. Other themes and motifs emerge, enhanced by Carrie Wood’s sensitive lighting. At any time, a performer may fall to the floor and lie there. Sometimes the women walk briskly on tiptoe, bent arms held up. Images of community appear. They sit quietly for a few seconds in the audience, in chairs at either end of the front row. Gradually their breathing—the only sound in the momentary silence—calms. They begin whispering to their seatmates, then rise and walk, still murmuring, in a comradely cluster. At one point, two of them sit on the floor, and the other two dive down to lay their heads in their colleagues’ laps. In a line, they walk to one of the windows at the rear of the Chocolate Factory’s loft and gaze out. Some of their activities are strangely violent. Maywald nestles behind Pauly, who seems in a trance, and drapes her long, curly hair over her friend’s shoulders. Then Lieber pushes Pauly with one hand; Pyle does it with a foot. Sometimes one of them will strenuously rub another’s crouching body with her forearms. Sometimes they collapse in an exhausted heap. Workum gives program credit to the dancers for their contributions to the movement material of the piece. Their creative involvement may be one of the reasons they perform with such powerful conviction. Through them, images of nature’s vagaries, liberty, spiritual vision, hard labor, and sisterhood come to life within the white brick confines of the narrow loft. Each one of the performers emerges as an individual joined by a structure that symbolizes common goals. Close to them as we are, we feel their efforts and their ardor when they explode into running and leaping. When they roll on the ground and lash their bodies extravagantly around, their loose hair fans out and sticks on their increasingly wet faces. We hear their panting. Early on, they remove their jackets. Near the end of the hour-long Fruitlands, they take off their black boots and stockings too and tuck up their skirts like women getting ready to wade through a stream. The music becomes increasingly rich and strange. A stringed instrument joins the piano. Voices are heard, and birdsong. But these echo and distort—once it sounds as if a harmonious 19th-century tune were being played backward—and often a low throbbing underlies them. As the women let their skirts down again and sway, their feet treading the floor, the music swells into something almost symphonic. The lights brighten to match its loudness. And in that heroic moment, the women walk away and leave the space for good. I read Louisa Alcott’s Transcendental Wild Oats just after completing the above paragraph. It was certainly an entertaining and eye-opening lens through which to contemplate Workum’s Fruitlands further. On the other hand, the dance as I saw it, without prior reading, enthralled me. I sensed rich thinking underneath it at every moment. I’m not sure what structure is given to the guest, but at the Joyce Soho on the particular evening (April 19th) that I’m describing, Netta Yerushalmy enters the stage from Brian Ireland’s boxy gray “house” on wheels to find the others in a circle waiting for her. Yerushalmy, a member of Doug Varone’s company and a gifted choreographer herself (she was just awarded a Guggenheim) dances for them. She’s a compelling mover, with a gift for merging precision with something freer, softer, and more risky to create a dynamically rich flow. The others, watching her closely, seem to be trying out her steps—at first in a desultory way—in order to make their own briefer variants. Yerushalmy spends most of the rest of Other Stories inside Ireland’s structure. From what you can glimpse when the mini-studio is turned briefly to show its partly open side, or divine from the shadows that Amanda K. Ringger’s lighting casts on a side wall, Yerushalmy is learning the phrases that each of the other dancers has formed from bits of her solo. We see variants of the basic material when, for instance, the dancers divide into two contrapuntal trios. They first perform somewhat raggedly, eyes on a temporary leader, but then more confidently. Other Stories ends when Yerushalmy reappears, and performs everything that she has learned, which is in turn based on her gleanings from I’m not sure what. It’s fascinating to watch the changes, deteriorations, and additions in what we first saw. Something else is going on, however. Perhaps I should say “Something Else;” it seems to be a chapter in a story that Beller is determined not to tell us outright. Ringger’s lighting digs at its drama, as does the dense, sometimes raucous, city-streets electronic score that incorporates the live guitar playing of its composer Robert Poss. Intermittently, brief films are projected to fill the back wall or a side wall of the Joyce Soho’s white room (Martijn Hart directed and edited these scenes). The first clip shows a deserted New York street at night. Through a window in the building closest to the camera, we see a man and woman talking, maybe arguing, in an empty apartment. They’re two of the dancers, but I can’t be sure which (Fulton and Rice, I’m told). Later, we see them again, from a closer perspective. They stare out the window. This time the man leaves. Another scene: Thomas-Train and Melaas wait on the Brooklyn Bridge subway platform. She gets on a train; he doesn’t. Another: Beller and Portier sit on a bench under an umbrella. These seem to relate to the live duets we see. In one of these, Beller, holding an open umbrella, and Portier have a side-by-side conversation in gestures that say with restrained force “we’re friends; we’re fighting; we’re still friends.” Fulton and Rice, moving around each other as they gesture, speak fragments of lines. Their words—glancing off the gestures— echo and interrupt each other in rhythmically interesting, very confusing ways. The lengthiest, most intimate duet— and the one that’s richest in terms of dance— takes place between Melaas and Thomas-Train. It expresses the shifting tensions of a relationship—the moments of succor and understanding that bleed into ones of contrariness, the aborted kisses. When featured onstage or in the “house” teaching Yerushalmy what she needs to know, the performers watch one another or take over an ongoing sequence. Certain motifs are repeated by different personnel. 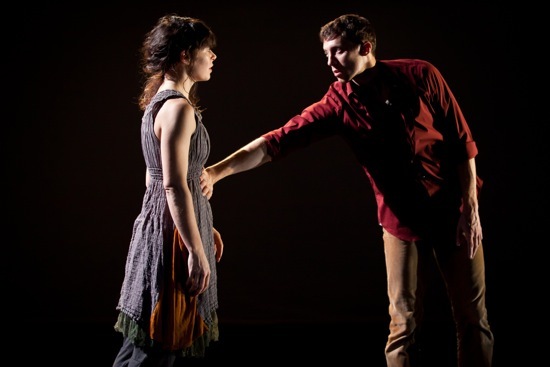 A man kneels in front of a woman and touches her legs. For a few moments, one person lies supine and another lies prone on top of him or her. Beller’s main intent in terms of the veiled narrative that erupts through words and movements seems not to let us know “what happened” but to school us further in perceiving that the interpretation of events is subject to perspectives and permutations. 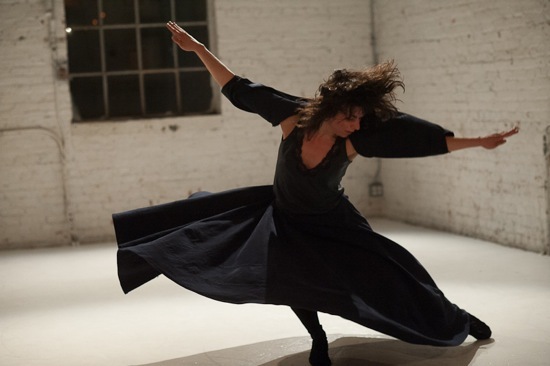 In other words, her treatment of the dramatic “text” is analogous to the way dance movements expand or deteriorate when passed from one individual to another. Certainly the most powerful relationships in Other Stories are not the fictional ones, but those among the vivid collaborating dancers in their casual, mismatched outfits by Karen Young. Katherine Profeta served as dramaturge for Beller. It can’t have been an easy job to advise the choreographer on how best to layer, interweave, echo, and contrast the fragmented narrative and the formal manipulation of movement. At some point, my attention to One Stories begins to wane, as if the activities, twisted through different prisms, have revealed everything they’re going to reveal. There’s something unwieldy about Beller’s structure, whether she’s trying to say too much or being too evasive with the bits of narrative or choosing “content” that’s so loaded that it grabs viewers’ attention. Certainly, in the end, you don’t worry about what may have been a senseless death somewhere; instead you cross your fingers that Yerushalmy will be able to perform everything she’s been learning all this time and do it with distinction. And, although a clearer statement about the process in the program would have made Yerushalmy even more of a hero, when she dances her final solo and the piece ends, the audience applauds enthusiastically. We sense the complexity of the process and are moved by performers so valiant, so willing to put themselves at risk. I go back and forth about program notes. Fundamentally, I’m a reader — I’ll get sucked into anything with print on it. One of the things I’ve always valued about dance, doing it and watching it, is that it isn’t primarily a verbal experience. I love the penumbra of information that can surround works with a complex recorded history or elaborate backstory, but I have to remind myself sometimes that it’s a dance with words alongside, not a novel with incidental movement. I spent a year once not reading any wall cards whenever I went to a museum — I haven’t repeated the whole experiment with my dance watching, but I’ve tried it a few times.